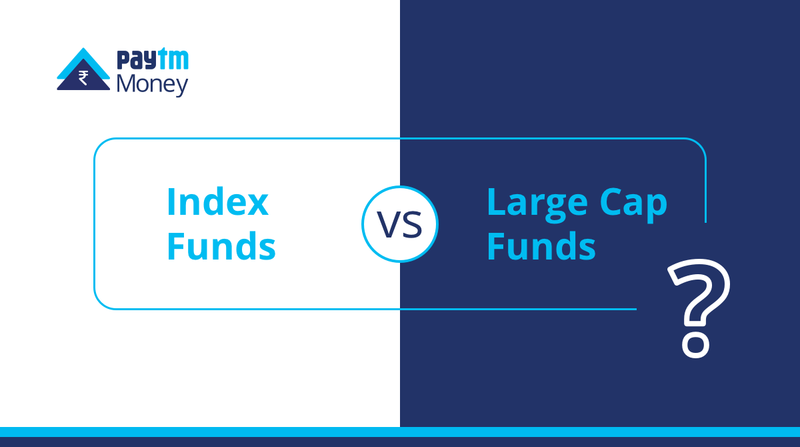 Index Funds vs. Large Cap Funds — Which one to choose? Over the last few months, you may have come across opinions on Index funds being better than actively managed mutual funds. This is because in calendar year 2018, Nifty50 Index funds gave close to 4% returns while many of the Large cap mutual funds gave lower or negative returns when compared to them. If you are contemplating between these two, read on to know which one to choose. Let us first understand the options available to you as an investor if you want to create wealth over medium term (3-5 years) with medium volatility. Most investment advisors would suggest to invest in an equity mutual fund, which in turn invests in large companies. NIFTY 50 is an index of 50 companies based on free float methodology i.e. based on the number of shares of the company in active circulation. Free-float methodology market capitalization is calculated by taking the stock price and multiplying it by the number of shares in active circulation. In this calculation, locked-in shares such as those held by promoters are excluded. Hence Nifty50 will be the benchmark to judge your mutual fund’s performance. Actively managed funds — Funds where the fund manager decides which companies out of 50 companies to invest in and which not to invest in to, based on his understanding of the market and the expected performance of the companies. All large/mid/small cap mutual funds are actively managed mutual funds. Since you have chosen to invest in large companies, we will focus on large cap mutual funds. Passively managed funds — Funds which basically track the composition of an index which can be any of Nifty50, Nifty Midcap100, BSE Smallcap, etc. Index funds are an example of passively managed mutual funds. For example, an Index fund tracking Nifty50 will invest in all the 50 companies just like the index itself. Since you have chosen to invest in large companies, we will focus on Nifty50 Index funds for comparison with large cap mutual funds. As discussed above, in a large cap fund (actively managed fund), the fund manager decides which stock or sector to invest in i.e. he takes decisions actively. On the contrary, an index fund just tracks the benchmark index, the fund manager just invests (passively) like the index itself. Since the fund manager is making active decisions in a large cap fund and has to spend time to form his sector/stock views, these funds have higher expense ratio compared to index funds. Now, in terms of performance, if the fund manager’s views are right, he can generate higher returns (out performance) compared to the benchmark (Nifty50 in this case). However, if his views don’t turn out to be right, it can lead to lower returns (under performance). Last year performance may suggest that index funds are better than large cap funds. But as most decisions for investments, what matters is long term performance and not short term outperformance. Let us look at the average returns generated by large cap funds compared to index funds for the last 10 years from 2009 to 2018. Note: For large cap funds, we have taken average across large cap mutual funds which have long term history; For Index Funds, we have taken average of Index funds which have long term history and track Nifty50. Historically, large cap funds have outperformed Index funds in 9 out of last 10 years. It is only in 2018 that Index funds performed better than Large Cap funds and that is also due to the skewed nature of performance of very few large stocks constituting Nifty50. These few large stocks in Nifty50 performed well while most stocks remained stagnant/declined. Hence although the Index moved higher, any diversified mix of stocks suffered due to most stocks not doing well, leading to large cap funds failing to match the performance of index funds. Looking at the historical returns, it is unlikely that this phenomenon will repeat in the years to come. It may be argued that as Indian markets mature, it would be increasingly difficult for active fund managers to generate returns in excess of their fund benchmarks. And Index funds due to lower expense ratios, may possibly beat Large Cap funds. The trend to shifting from actively managed funds to passively managed funds has become popular in US over the last few years. However, comparing a developing economy like India with the developed economy like the US may not be correct. In a developing economy like ours which has limited mutual fund penetration, excess returns (over index funds) may still be generated through active stock/sector decisions by the Fund Manager / AMC. In this context, for most investors who are looking to create wealth over medium-to-long term with medium volatility, large cap funds may be a better investment option compared to Index Funds for now. However, a new investor looking for equity exposure can start with index funds to get a flavor of the equity markets, as he is most likely to understand the index returns given it is widely stated in business media. Even for an experienced investor looking for index like returns at low cost, index funds can be chosen with the knowledge that scope for out-performance is very limited. How can you do this in Paytm Money? At Paytm Money, we have a curated list of large cap mutual funds, available under Investment Ideas named “Invest in Large Companies”. We also have a handpicked list of “Index Funds” under the same section. Mutual Funds in these lists feature post taking relevant qualitative and quantitative parameters into consideration. Our two cents: Whether you choose Index Funds or Active Funds, stay invested for the long haul, via SIPs. Whichever you may choose, both are really easy on Paytm Money.